The JCI Meadowbrook and Battery Test Facility team during the spring pickup in 2017. 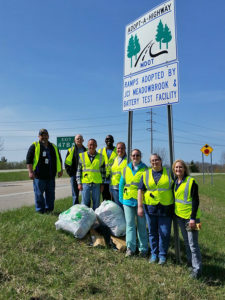 Highway roadsides across lower Michigan will get a spring cleaning beginning Saturday as volunteers in the Michigan Department of Transportation (MDOT) Adopt-A-Highway (AAH) program head out to pick up litter from April 14 to 22. Due to snow still on the ground in some areas, the first Adopt-A-Highway pickup for the northern Lower Peninsula and Upper Peninsula will be later, from April 28 to May 6. Volunteers pick up litter three times each year. Statewide, there will be a summer pickup from July 14 to 22 and a fall pickup from Sept. 22 to 30. The AAH program began in Michigan in 1990. Today, more than 2,800 groups have adopted more than 6,300 miles of state highway. These volunteers collect 65,000 to 70,000 bags of trash annually, an estimated $5 million value for the state. AAH groups wear high-visibility, yellow-green safety vests required by federal regulations when working within a highway right of way. 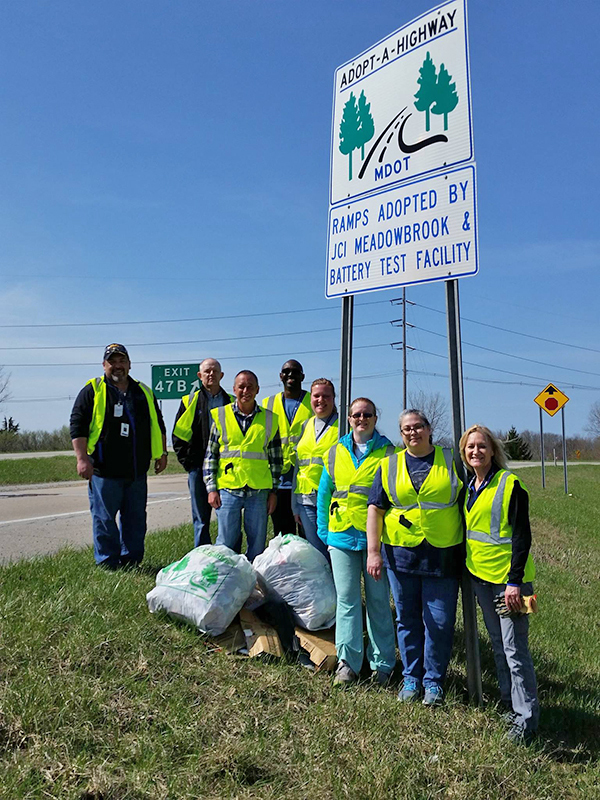 MDOT provides free vests and trash bags, and arranges to haul away the trash. Volunteers include members of various civic groups, businesses and families. Crew members have to be at least 12 years old and each group must number at least three people. Sections of highway are still available for adoption. Groups are asked to adopt a section for at least two years. Adopt-A-Highway signs bearing a group’s name are posted along the stretch of adopted highway. 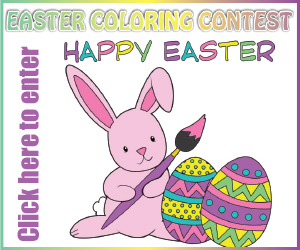 There is no fee to participate. Two sections of US-131 in Cedar Springs/Sand Lake that are open are from 18 to 16 Mile and 22 to 20 Mile. For more information, go to www.michigan.gov/adoptahighway.